At the start of the month we could hear a big commotion between lions at night. In the morning we found Sebastian, one of the resident males, with a big scar on his face and it appeared that he had fought with his brother lion, Old Gun, over the mating rights to one of the females from the Wapoka Pride. They had been together for a week and were both looking very skinny having had other things on their mind apart from food. Old Gun appeared to be the winner of the battle for dominance and was growling at his brother when we saw them the next day. We watched a sensational kill on an impala by the Wapoka Pride; one female circled around and drove the impala right into the mouths of the rest of the lionesses. The same pride also killed a wildebeest and we saw one of the young males on an elephant carcass. 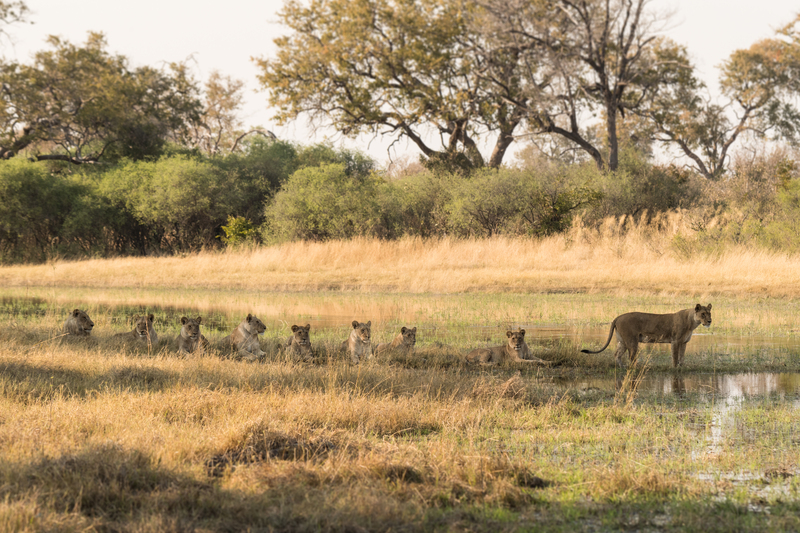 The Bonga pride of nine lions were found close to camp and one time fighting with a honey badger, although the smaller creature managed to get away. One of the Bonga lionesses who has cubs of 3-4 months old was discovered feeding on a fresh warthog carcass and was also seen hunting lechwe along the marsh. At one stage this young family was joined by the two big resident males. 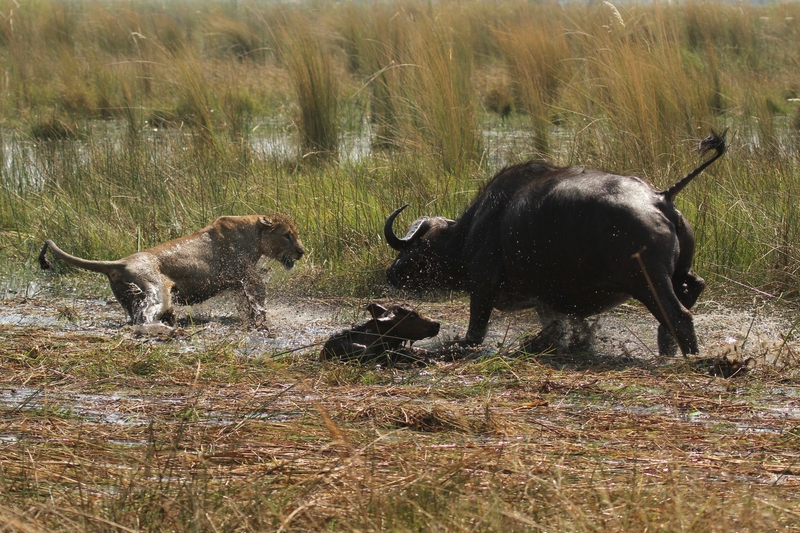 Four new lions, three young males and a female, were located seen feeding on a buffalo. These animals haven’t been seen in our area before and were quite shy. Our resident female leopard, Jane, reappeared back in the area after having been absent for a long while. When she left she had two cubs, but there now appears to be just one remaining. When we first saw them they were feeding on a red lechwe carcass that seemed to be a few days old. 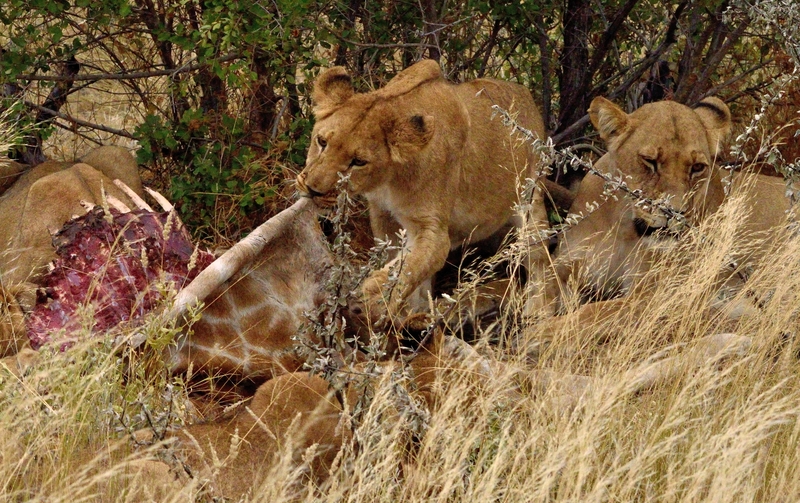 Some lionesses came and took the kill from them, but they seemed like they had a good feast before they were robbed. A few days later they were hunting in camp and managed to kill a bushbuck and drag it under some bushes to eat. 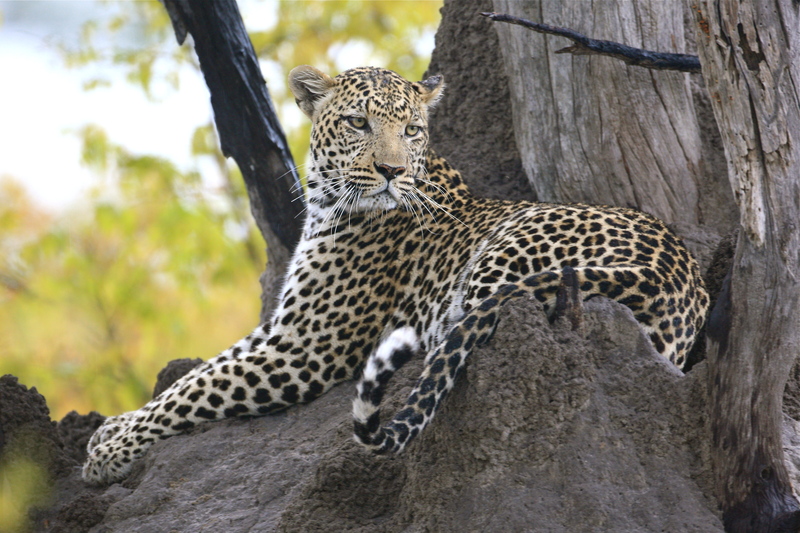 A tom leopard was located very close to camp and we followed him as he was hunting along the edge of the marshes. A male leopard who is a brother to the resident Fisherman was identified as he was found finishing up a reedbuck that he had killed a couple of days previously. One afternoon we were lucky enough to come across an elephant who had only just given birth. The calf was still covered in blood and helplessly trying to get up. The rest of the herd gathered around to help. A truly magical time was had watching a huge herd of elephants bathing and splashing in the marshes. The resident pack of two wild dogs came through the camp a couple of times hunting bushbucks but didn’t manage to make a kill. 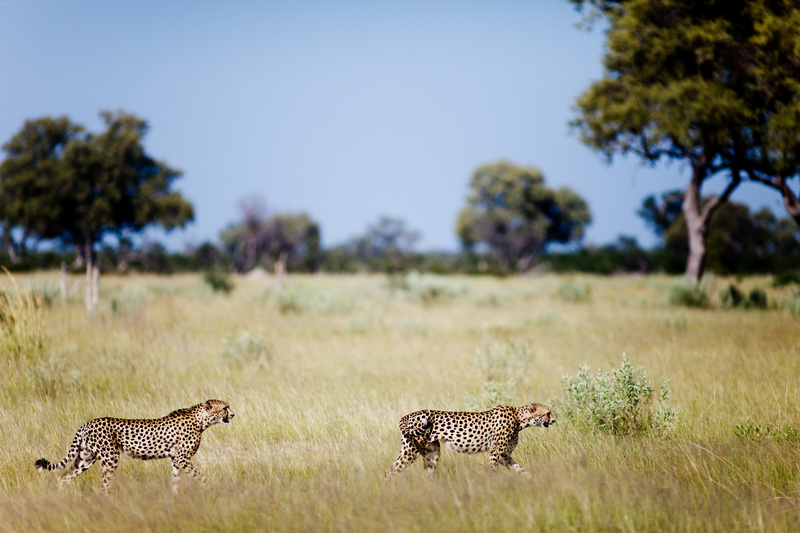 The two cheetah brothers were seen in the Lebala side of the Kwando Reserve, sometimes posing beautifully on termite mounds or on their marking trees. One time we were following them and they came across mating lions who chased them away. Luckily the cheetah managed to escape. On evening drive we were lucky enough to find a pangolin; an incredibly rare species that we are doing well to find a few times already in Lebala this year. Two honey badgers were seen chasing mice near to the airstrip. Black-backed jackals were also in the area. A large number of carmine bee-eaters started to flock into the area for breeding season and could be seen gathering at John’s Pan. July was a great month for lions at Lebala with both the Bonga and the Wapoka prides being seen. The Bonga pride of nine stayed in the northern area where they were often seen following a huge herd of buffalo leading to some magnificent sightings. One day we heard the lions growling in the woodland and found them fighting with a big buffalo. The fight lasted for at least fifteen minutes before they eventually killed the bull. It took them a couple of days to devour the whole animal. Another time we saw two adults and seven sub-adults trying to drag down a buffalo and were jumping on its back, but the rest of the herd returned and drove the lions away. Other times they got luckier and we found them eating buffalo carcasses. Six members of the Wapoka pride were found north of the camp feasting on a wildebeest carcass that they had just killed. The following day we tracked them towards the airstrip and were lucky enough to see them taking down an impala right in front of our vehicle. We also located them stalking zebra. Two male lions known as the Selinda Boys were found back in the south of the Kwando Reserve after having been away for about six months. We noticed that a resident female lion with three cubs about eight months old appeared to be very nervous of the intruders and was quickly mobilising her family to be as far away from them as possible. The resident tom leopard known as “Fisherman” was seen more than once in the marsh area targeting red lechwe. We saw him try and miss one time, but on another occasion we were lucky enough to see him bring down and kill a young ram. To the west of the staff village we watched a great interaction between a male leopard and a spotted hyena. The leopard took a kill from the hyena and ran away with it but was quickly caught by the hyena who took it back. The carcass was passed back and forth four times before the leopard eventually managed to drag it up a sausage tree and out of the hyena’s reach. A female leopard was seen hunting, providing some wonderful photo opportunities as she climbed termite mounds and trees to scan the area. A pair of spotted hyenas accompanied by a sub-adult were seem mobile towards the old hyena den by the airstrip. 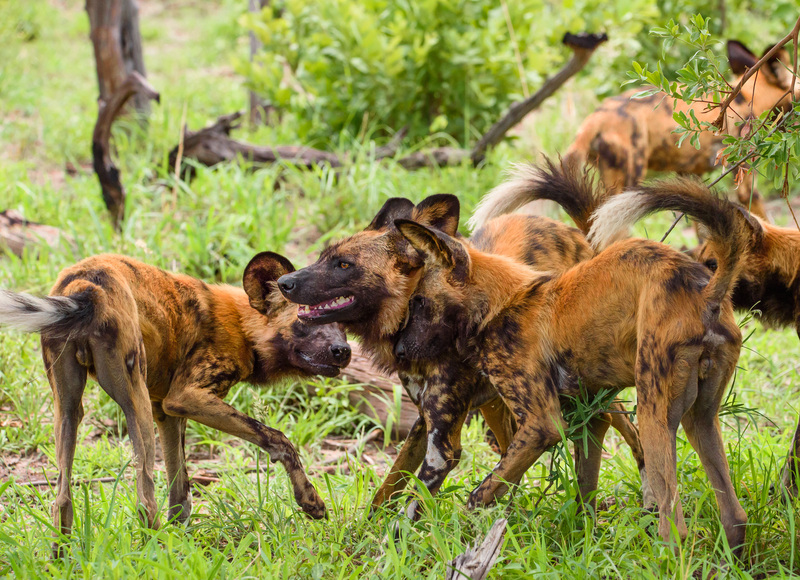 The resident pair of wild dogs were seen running around camp searching for something to eat. 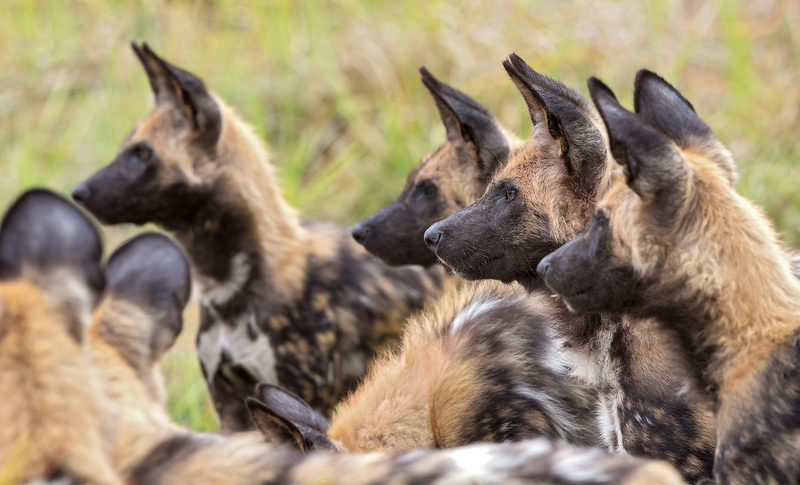 At that stage they had a single puppy trailing along behind them, leading our guides to suspect that the rest of the litter may have been killed by predators. Unfortunately as the month progressed the single remaining pup also disappeared. Big herds of elephants have returned to the riverine area and guests really enjoyed watching them bathing and playing in the water. General game was plentiful including very relaxed herd of sable antelope. Honey badgers were seen digging for mice. Guests enjoyed seeing a big colony of dwarf mongoose and watching how they used a sentry system to look for danger. Guests were thrilled with some great sightings of rosy-throated longclaw. This species is often hard to see well as they are usually found in deep grasses and marshland, so it was a treat to be able to show keen birders the bird out in the open. Another incredible rare sighting was the African swamp hen which was located by the marsh. Unusually we spotted some carmine bee-eaters; these are usually summer migrants, so it is strange that some have decided to over-winter in the area. The Bonga Pride of lions comprising eleven adults and three cubs of about nine months were still in the area. One of the lionesses had split away from the rest of the family whilst she was nursing her two smaller cubs. 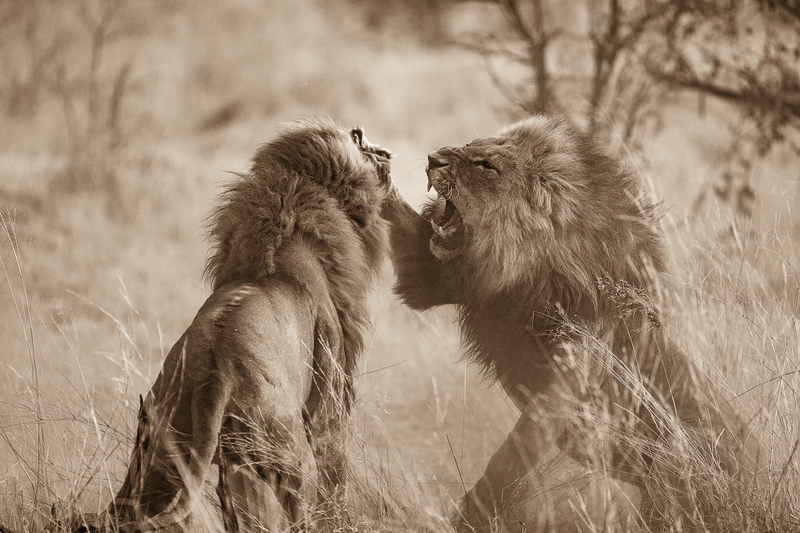 We found the pride together enjoying kills of buffalo, wildebeest, warthog and zebra on numerous occasions. They spent time during the day at the various waterholes, always with an eye on the opportunity to ambush prey coming down to drink. The two big dominant males, Old Gun and Sebastian, were starting to give the two-year-old males a hard time, injuring one of the youngsters, and our guides feel sure that they will soon be driven out of the family group. Another time two of the boys were seen fighting with a honey badger. True to its reputation the honey badger put up a ferocious defence and it took almost an hour for the lions to eventually kill it but after all that effort they decided not to eat the honey badger’s remains. The Wapoka Pride were also seen including two of the lionesses hunting warthogs near to the river. As usual for the Lebala area, hyenas were often found near to the lion prides hoping for the chance to steal a kill. We also found a clan of twelve hyena on a kudu carcass which we suspected had died of natural causes. They were eating vigorously and didn’t take long to finish the meat off. Vultures were nearby to pick the bones clean, giving our guests a wonderful opportunity to see nature’s clean-up crews in action. A leopard was located near to the staff village and guests were lucky enough to watch him kill a civet right as we followed him. This beautiful tom, known to the guides as The Fisherman, was seen often in the marsh area. African wild cat was located on night drive hunting and more unusually also seen in the open during the day. Elephants were seen crossing the river and it was fun to see them playing and bathing in the water. Herds of buffalo were also starting to come back out of the mopane woodlands and back towards the wetter areas. A lovely herd of ten sable adults with six calves were located. As the floods started to come into the Kwando Reserve we had fantastic sightings of red lechwe herds splashing through the water. Other general game species located often included giraffe, zebra and kudu. A resident pair of two wild dogs came into the camp one morning and seemed to be in a hunting mood as they were running around the camp. Eventually they seemed to decide that luck was not on their side and they spend the day lounging by Room 9. Another time they were managed to kill a kudu calf and we were delighted to see that they had a puppy trailing along behind them. All of a sudden, a hyena appeared and managed to confiscate the carcass from the pack. The dogs were also found feeding on an impala east of our airfield. The coalition of cheetah brothers spent time on the Lebala side of the Kwando reserve where they were seen spraying on trees to mark their territory. This lovely pair of cats can be quite playful with each other as they scamper up and down trees. Birding was good, especially by the river where we saw saddle-billed storks, egrets and ibis. A remarkable sighting of twenty wattled cranes shows that the Kwando reserve is doing well in augmenting the Okavango Delta as a stronghold for these endangered birds. Guests also enjoyed a lovely sighting of a Verreaux’s Eagle Owl. The Bonga pride of lions were still in the Lebala area during May, though it appeared that they had started to move = back towards their usual territory nearer to Lagoon camp. Whilst the Bonga Pride had been around, the Wapoka Pride had moved south of the Kwando Reserve, but towards the end of the month they seemed to realise that the territories were shifting and we found them back in our area again devouring a wildebeest. As they were feeding, one of the dominant males known as Big Gun came to claim his rights at the carcass. One of the young males from the Wapoka Pride tried to defend the food but was very quickly put in his place by the mature lion in a swift but dramatic fight. We saw eleven Bonga lions hunting amongst a big herd of wildebeest. They managed to bring down and kill two of the wildebeest at once. Another time the lions killed a wildebeest in a waterhole and as we arrived the big male was seen dragging the carcass out of the water. Although mainly seen targeting wildebeest, the Bonga pride were also seen successfully hunting buffalo at the large end of the prey scale, and warthog at the other. 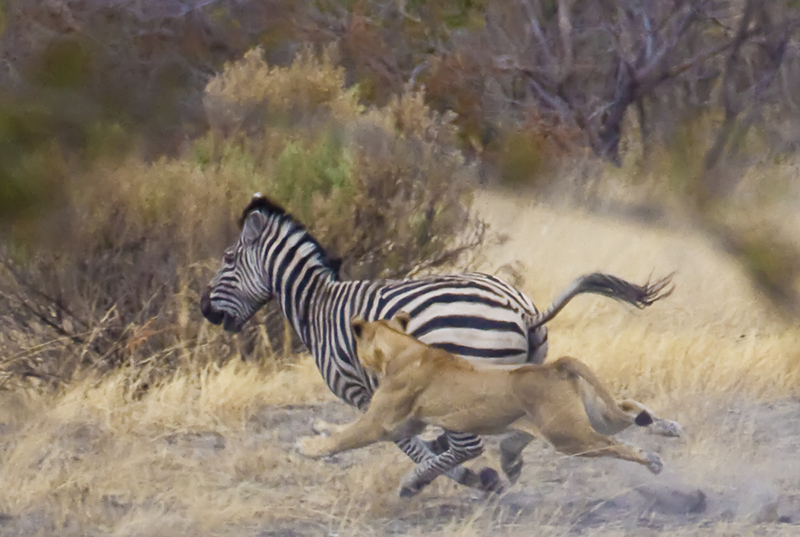 One day, we had been watching the pride hunting zebra when they encountered a puff adder which became aggressive. True to its name, the snake inflated its body to make itself appear bigger and try to scare the lions. A mother lioness with three cubs of approximately nine months old appeared to have split away from the rest of the pride and was occasionally joined by the dominant males. A sub-adult male appeared to have been kicked out of the main pride by the dominant males and was seen on his own for most of the month. We enjoyed seeing some of the smaller rare mammals at Lebala during May. A sighting of two aardwolf was enjoyed near to Skimmer Pan. The two animals were moving through the grass. We were also lucky enough to find a porcupine running in front of the vehicle during a night drive. A serval was also spotted hunting after dark and to cap off a great month we came across a pangolin on the road looking for termites and ants. Our guides were delighted to find the resident female leopard, Jane, with her two cubs. Last time we had seen her a couple of months previously she appeared to be looking for one of her cubs, so it was a huge relief to see the family back in the area, and apparently all doing well. On a morning game drive to Motswiri Pan our guide noticed impalas, birds and squirrels all shouting alarm calls. He quickly followed up and found a resident male leopard, known as Fisherman, feeding on a banded mongoose. 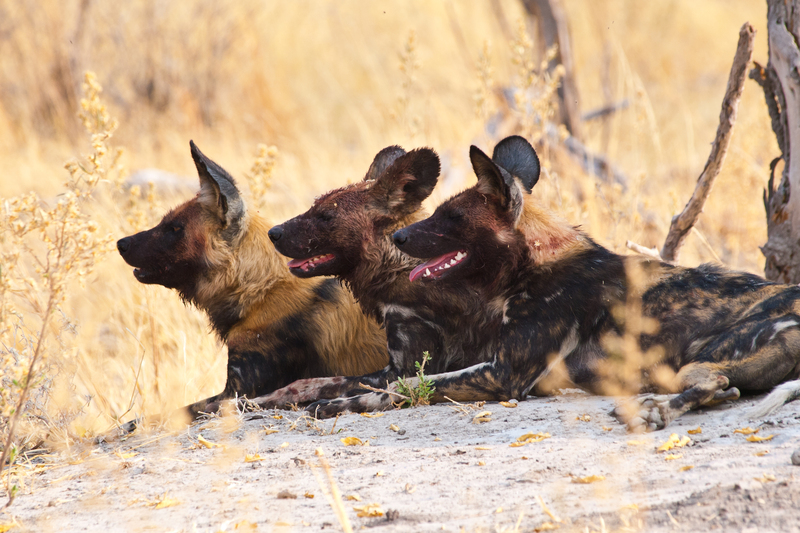 A pair of wild dogs have been coming to Lebala from time to time and the female appears to be pregnant. In the middle of the month they pulled down and ate a bushbuck within the camp surrounds. At the hyena den, there appeared to be just two cubs. As the weather stayed fair and the inland waterholes started to dry up, big herds of elephants started to return to the riverine area. There were also plentiful giraffe and buffalo coming out of the woodland to find water. A big herd of eland, grazing in a mixed herd with zebra, was sin the area. Guests were also happy to locate some sable bulls. The water levels in the marsh had started to rise with the incoming flood waters, bringing with it large herds of red lechwe. We had good sightings of them running and splashing through the shallow waters.